That’s 242,623 respondents — or 46.9 percent — who support the decision to disqualify the players. (Translations on the answer choices are mine.) By contrast, only 26.9 percent oppose the decision. Chinese coach Li Yongbo recently issued a very straightforward and sincere apology for the team’s actions and not upholding the “competition’s spirit.” You can watch that here. He said because of the new rules this year — pool play is new; previous tournaments featured one big bracket, like in tennis — the team didn’t have a full understanding of the format. I’m reading a little bit into his answer here, but he thought — as he should have, I might add — the point of the pool play was to set the teams up for the best possible outcome in the elimination portion of the competition. Li comes off as a reasonable and articulate man, and the apology really was pitch-perfect. Wang and Yu have also apologized on camera. 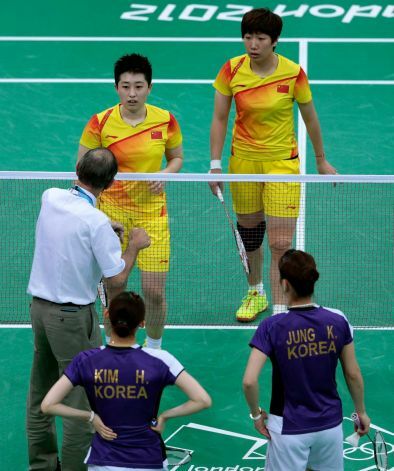 Yu said they violated the Olympic spirit, and Wang vowed to compete her hardest from here on out. UPDATE, 12:31 pm: Here’s the link to the poll (click “I want to vote” [我要投票] to participate; I just voted OPPOSE). UPDATE, 1:30 pm: Yu Yang announces her retirement on Tencent Weibo and speaks out against BWF, and a Chinese journalist reports that Yu and Wang’s decision to tank was influenced by a knee injury Wang sustained during warmups. Where is the live link for this poll? This is completely contradicting to any other poll on Weibo. Thanks, good point — I’ve appended into post. cheating, lying have always been western white trash’s best friend. now they have added photoshopping. Yeah, those honourable, Olympic-spirited Westerners would never throw a match for an easier route to the finals. And if they did, surely they would be condemned and definitely not hailed as national sporting heroes in a BBC made-for-television movie! Ridiculous comment, that story was from 1948.. This is BAD SPORTSMANSHIP and basically CHEATING to influence the draw. If they or their coach didnt understand that, and didnt understand you CANNOT throw a game to influence the draw, they should sack their coach as well..
“Yeah, those honourable, Olympic-spirited Westerners would never throw a match for an easier route to the finals.” – FYI ALLL athletes are expected to uphold the “Olympic Spirit”, not jsut the Western countries..
hahahhaha westerners like matt r love to get stuck in between yestarday’s news. she passed the drug test, and you can move on now, boy. btw you white people’s dirty tricks do not work against world class athlete like Ye Shiwen. Besides thanking her coach and her country, she also told the world that those “noises” will not affect her performance, and she proved it by winning her second gold. oh one more thing, son, if you wanna keep arguing about doping, michael phelpes is very glad to discuss his legacy with you. Firstly dont call me “son” or “boy” you condescending moron..
“she passed the drug test, and you can move on now, boy.” – yeah and several previous world champs (from various countries) have passed the drug tests at the time, to be found to be cheats when technology caught up with them several years later. I was stating a FACT, the FACT is that China had institutionalised drug cheating in their Olympic teams in previous years. Hence why the rest of the world is so suss when a 16 yr old girl swims faster than the guys..
Flo Jo was considered a world champ, until she was proven to be a drug cheat. Ben Johnson,considered one of the greatest runners ever, found to be a drug cheat..
“btw you white people’s dirty tricks” – cant even diguise your blatant racism can you..
Not a SINGLE COMMENT I made was derogotory to another race. Andy – “She also only swam 1 split roughly at the same speed as lochte. Sure she may have used an anabolic agent but you can throw that same suspicion on every winner in track and field” – um, the suspicion is raised when a female swimmer swims faster than a man. NEVER been seen before, hence the suspicion is well founded I think. I would also be suspicious of any female TRACK athlete that ran faster than the men.. Pretty reasonable if you ask me..
“Naira says: – hahahhaha westerners like matt r love to get stuck in between yestarday’s news.” – IM sorry how am I stuck in yesterdays news, it was not posted by me.. Which was my whole point, that story is over 60 years old and not relevant at all..
John Leonard, executive director of the World Swimming Coaches Association described Ye’s performances as “disturbing” but the young swimmer dismissed the allegations and Olympic officials insist that she is clean until proven otherwise. So the head of the World Swmming Coache Assoc. seems to think there is something suss about Ye’s swim, he calls it “disturbing”.. He would be well placed to make that judgement I think. History may prove us wrong (generally it hasnt, people who are suspected of drug cheating are usually found to be, up to several years later), but if she is just an “incredible athlete”, good luck to her.. The event took place in 1948. The film celebrating it was made in 2012. How is that not a contemporary reflection of attitudes towards throwing a game? Think about this a minute. She’s 16. That means China had the technology to physically enhance a human being via genetic alterations without ANY major side effects in 1996. Are you kidding me? No one can do that even today. She also only swam 1 split roughly at the same speed as lochte. Sure she may have used an anabolic agent but you can throw that same suspicion on every winner in track and field. In fact, you’re more likely to be right if you do that. As for the DQ, yes, they definitely should have been DQ’ed. They knew it was wrong at first, evidenced by the fact they sneakily tried to tank early on. Pool play has been around. In a larger team sport with subs, you could obviously go with lesser players, rest your starters, but the players involved have to play. It’s always been like that. It’s not even sport if you try to lose. If there’s strategy on the field, why not allow strategy off the field? Strategically ensuring the best possible outcome should be within the “rules” of sportsmanship, no? 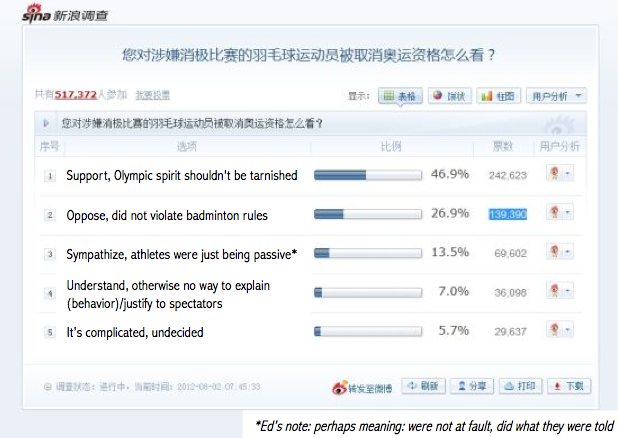 Interesting that the Sina Weibo survey shows more Chinese netizens support the disqualification but a global audience thinks the strategy is acceptable (although WSJ has much fewer votes).